This Clarisses photo was shot at chapel in Ano Syros (Syros island, Greece) in summer 2008. I found a small chapel and entered. No people were inside. 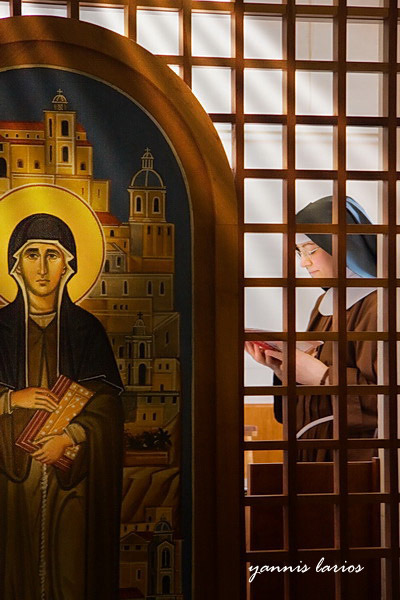 There were just two nuns, hidden behind a wooden barrier and unseen. Two nuns, one playing the organ and one singing a chant with a glorious voice, praying alone inside. You could not see them but they were there, singing gloriously. They had no audience, but they put their best for their faith. I stayed there for about 20 mins in awe, waiting to see any of them behind the barrier. I kept waiting for a glimpse that could really depict the glory of the chant and of the moment. At the right moment I managed to capture this glimpse of their devotion. PS: Ines, a “digital” friend was kind enough to e-mail me some further details on Clarisses. Indeed Ines, their voice was something else! Thank you! This entry was posted in photography, Stories behind photos, Yannis Larios | Greek Travel and Wedding Photographer and tagged Aegean, chorus, christianity, church, Cycladesm, Greece, JPG, photo, photography, religion, Syros, vote. Bookmark the permalink. ← “Can photography change the world?” Hosted in Digital Photographer magazine..
Shame. I really liked your work and had even picked out some prints of Meteora and Santorini before seeing this work. I am a photographer and, regardless of your views on religion, find this repulsing and horribly disrespectful. These are Women of God, not street performers, and this is the House of God, not another tourist zoo or one of your “stages.” This is their lifelong devotion, their calling, don’t disturb it. Contrary to popular belief, photographers do have limits. You should never shoot inside a church, especially one that is in use, unless it’s open to tourism – like St. Peter’s. And at the very least, you need to ask your subjects for permission before capturing the moment. Otherwise, you’re no different than a stalker and a paparazzi. It’s proper etiquette and in many other parts of the world, you may just end up mugged if you don’t. I beg you to think twice before exploiting faith again.